The company ““Agro-Dren”“ is a family business operating continuously since 1979. The majority of the products, presented in our offer, have been originally developed and produced by our company. The main and most important products in our offer are drainage pipe fittings, available in diameters ranging from 50 to 160 mm, as well as pipes and fittings for internal and external sewage system. Our range of products is aimed mainly at wholesalers, stores specialized in construction industry, as well as at domestic and foreign manufacturers of sewage systems. Finally, the individual customers are welcome to our on-line store with the full range of fittings and pipes for sewage systems and drainage. Our items drainage systems of PP drainage pipes in the buffer zone and without cover and drainage fittings in diameters ranging from 50 to 200 mm. 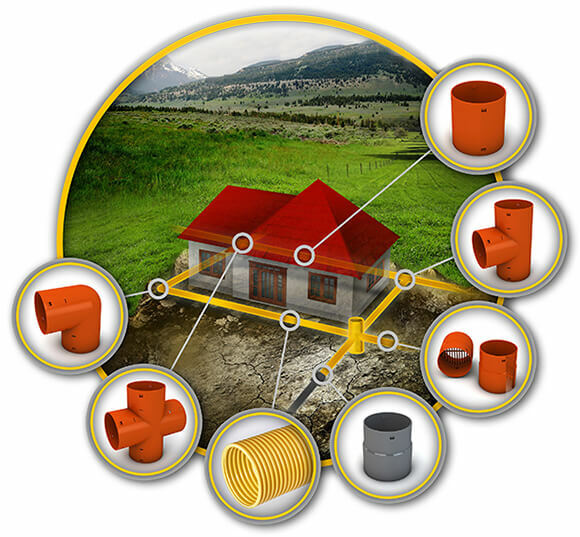 Drainage solutions is used for drainage of agricultural land, crops, sports, recreation. Successfully they apply also for drying buildings and road eg tunnels, roads, etc. Drainage systems protect against the influx of water in all fields of construction, in various geological conditions in areas of sandy, coarse and structurally stable.